A surprisingly smooth ride—so far. For entrepreneurs running a financial technology company in the UK, there’s no shortage of money these days. Venture capital investment into the sector set records all over the world last year, and Britain was no exception. But could there be too much of a good thing? Britain, after all, has major headwinds: The UK is scheduled to leave the EU at the end of the month, and it’s anyone’s guess how it will turn out. Access to the bloc’s single market, as well as its talent, is still up in the air. 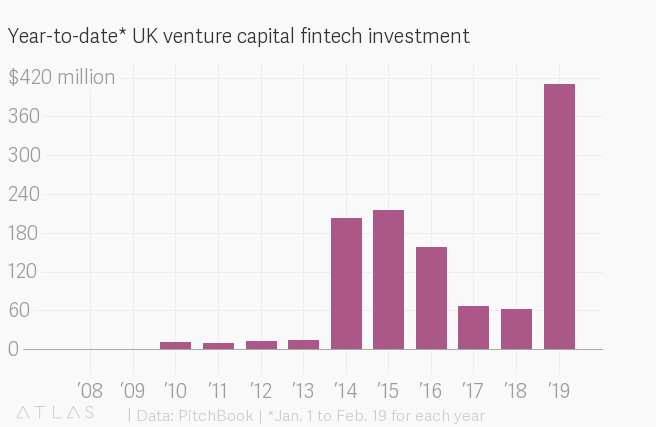 Even so, the UK led the region in fintech investment in 2018, raising about $1.7 billion, compared with $3.5 billion for all of Europe. And its financial technology startups are again raising money at record pace this year, according to data from financial data company PitchBook. Investors are ebullient, but there are signs that startup founders—a perennially optimistic bunch—have growing doubts about the outlook. Some 75% of UK entrepreneurs surveyed for a Silicon Valley Bank report (pdf) expect Brexit to be a drag on the country’s innovation economy. The percentage that expect business conditions to be better than the previous 12-months has declined every year since the referendum and now stands at 41% (That figure was 58% in 2016, the year the Brexit vote took place). Even three years ago there were worries that the fintech scene was getting frothy, says Tom Butterworth, managing director of early-stage practice at Silicon Valley Bank. He notes that venture capital firms have raised record amounts of money and still have a lot of dry powder. These days they’re writing bigger checks to a smaller number of companies, but, he adds, smaller firms may not have as much access to funding. He also says Silicon Valley investors have been increasingly coming to Europe to meet with companies. “That goes completely against the mantra that VCs in the Bay Area will only accept a company that’s a bicycle ride away,” he said. Many of Britain’s most aggressive startups have global ambitions, meaning, as Brexit approaches, they aren’t solely tied to the UK economy. Access to talent is the biggest concern. Nik Storonsky, CEO of consumer-finance startup Revolut, recently urged the UK to create a specialized, fast-track visa for technology workers. The company employs 740 people, many of them based in Britain, and plans to double its London headcount this year. Storonsky says about 70% of the firm’s software engineers and data scientists are recruited from abroad. Europe’s consumer-banking startups are some of the highest flyers. But valuations for companies like Monzo and Revolut are galloping far ahead of revenue so far. Monzo raised $110 million late last year, while Revolut is seeking $500 million or more in 2019. A key question for startups, including the most sought-after fintechs, is whether they have a lasting competitive advantage, says Eyal Malinger, investment director at venture capital firm Beringea. The company must be able to make its product cheaper, or have some sustainable advantage in terms of technology, brand, or intellectual property that customers will pay for. And sooner or later, investors will value these companies on actual fundamentals like projected cash flows, he says.